The photo id for this photograph is 55, in the Trains and Railway Lines album. 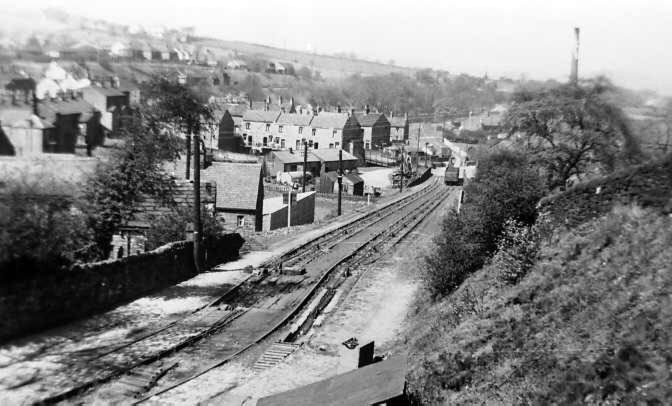 Whaley Bridge Incline on the Cromford & High Peak Railway, looking down towards the canal basin. Although undated, this picture must have been taken around 1950/2, as for one thing, the roof of the Co-op garages (built around 1949/50) can be seen on the LH side, and the haulage chains can still be seen on the pulleys on the incline. These were removed fairly quickly after closure of the line in 1952.